In forex spread trading the euro spiked higher yesterday to around $1.3198, which was its highest level in over a week, on the back of the ECB's lending spree to 500 Eurozone banks. Nevertheless within four hours the euro gave back around 150 pips from that high. Traders know that this won't be the end of the debt crisis and credit rating cuts around the Eurozone are imminent. The EUR/USD market is on the up at the moment though, as traders are anticipating decent US data later today and have good expectations that things are improving across the pond. Therefore, they are happy to take on more risk today and move out of the safe haven dollar. As we know though, we are in a bearish market and any upside is likely to be limited to very short term. The pair is currently trading at $1.3110 and is heading towards its next target level at $1.3140. The risk appetite that seems to have built up in the past 24 hours has rubbed off well on the single currency. The euro made decent gains against the US dollar yesterday and it looks like the $1.3000 level is a very strong support level. This morning we're higher again as EUR/USD trades at $1.3165 at the time of writing. This area was considered to be a bit of a near term resistance so now the bulls will be expecting a move to test the $1.3235 area. Sterling will be in focus this morning with the release of the Bank of England's minutes. Sterling has enjoyed some good strength against the single currency in the past few weeks but the GBP/EUR market can't quite make it beyond the €1.2000 level. Moody's announcement has just but further sterling advances in check but further risk appetite could support the pound, in particular against the dollar. At the time of writing GBP/EUR is at €1.1970. For those trading Forex CFDs markets, there were no surprises that the euro started the week on a downer after Europe failed to stump up the €200bn they need to bailout Eurozone governments. The coup was €150bn, which of course doesn't include the €31bn demanded of the UK after Cameron vetoed the EU treaty plan. Finance ministers are now relying on countries such as Sweden and Poland to put their hands in the pockets and help out with contributions. If we actually take a step back though, we realise that even if the €200bn had been raised, it wouldn't make a difference since Italy alone needs €300bn in refinancing. This morning, the euro is slightly up against the dollar at $1.3012 with support at $1.2980 and resistance at $1.3050. Economic data is thin on the ground today and actually remains the case for the rest of the week. A few highlights but nothing that could be expected to cause any major moves. The negativity in equity markets is rubbing off a little on the FX world as there's a mild brush of dollar strength so far this morning. The announcement of Kim Jong-il's death lead to a natural move higher for the US currency, but it hasn't been a massive move to the upside. The euro continues to hold onto the $1.3000 level with EUR / USD trading at $1.3030 at the time of writing. Near term support and resistance of the pair is seen at $1.2950/1.2880 and $1.3050/3100/3160 respectively. Investors continue to battle against the back drop of this European debt storm and indecision continues to remain rife. When you get assets like the US dollar spiking you have to start to worry. The normally perceived safe haven of gold has seen a mass exodus and volatility remains high. The dollar index is back above the 80.00 level, not seen since the beginning of October when stock markets had that crash in August and September. In the forex markets, the euro seems to have found a level at $1.3000 against the dollar where the bears have run out of momentum to push the single currency lower. Flat to lower this morning EUR/USD is at $1.3010 and with the trend lower still very much negative there are few bulls out there to support the euro. In fact, even if there are any, a move higher would probably be seen more of a bear squeeze than a reversal of the trend. Despite all of the efforts being made by European leaders, a possible break up of the Eurozone is becoming more and more likely. Signs that people are preparing for such a break up are already being seen as money presses for individual currencies such as the Drachma and even Deutsche Mark are ready to go at a moment's notice. In addition, the world's biggest inter-dealer broker has been testing its execution systems for currency deals in the event of anyone exiting the Eurozone. As a result the euro has taking a pounding, most literally too as sterling looks increasingly like more of a safe haven than many other currencies. GBP/EUR has been heading back towards €1.2000, but just this morning is running out of steam and the interest on UK gilts continues to head lower as investors buy up UK government bonds as a safety precaution. This once again indicates the faith the bond market has in the coalition's deficit reduction plans, even if they are going slightly off target due to the lack of growth. Even though the European debt crisis has dominated financial markets throughout 2011, and seems to have been all this column has been writing about, there seems to be little prospect of that changing into the New Year. With global equities dropping like a stone over concerns that a Eurozone debt resolution will not be reached anytime soon, the euro was inevitably only going to go one way. The single currency dropped below the big psychological level of $1.30 which, as we said a couple of days ago, was the low last January and subsequently the next downside target. The EUR/USD contracts for difference market is pushing higher this morning to around $1.3030, but traders should tread with caution as we're in a bear market and any upside is likely to be limited to the very short term. A credit crunch across Europe is underway which can explain why the euro took such a bashing yesterday. However, despite this crunch, the equity markets seem to be largely ignoring the similar situation that we faced just over four years ago. Just as back in the middle of 2007 when the last credit crunch lead to the then banking crisis, this time there's a real threat that this one could fan the flames of the sovereign debt crisis. As banks deposit overnight money with central banks as opposed to other banking institutions the lack of liquidity means that less cash is available to drip feed through to the wider economy. This causes the vicious circle to continue going round as the lack of funding to businesses and individuals knocks growth on the head. This in turn puts further stress on countries' budgets which are already feeling the squeeze from austerity. The one major thing that Europe really lacks at the moment is confidence and that confidence doesn't exist because there is no clear growth strategy. It's all about austerity and imposing fiscal discipline, which is required to a certain degree, but without any real growth plans the problems will only get worse. As mentioned above, the euro was beaten up badly yesterday as bears drove the single currency back down towards $1.3000 against the dollar. Here it seems to have found a degree of support with EUR/USD trading at $1.3040 at the time of writing. Key levels to watch are $1.3000 and $1.2950 to the downside with $1.3100/60 and $1.3240 being seen as resistance to the upside. There's lot's of economic data out today, with UK inflation numbers to get us underway. CPI is expected to dip below 5% and from here on in expectations are for a continuation of softening inflation which will be welcomed by consumers. Then we get the German ZEW survey, followed by US retail sales at lunch time and we end the day with the FOMC rate announcement. 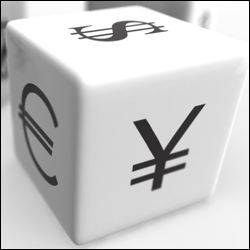 FX investors saw the euro take nearly a 200 pip hammering against the dollar yesterday. This came as the grim reapers of the credit rating world said that the EU summit last week really didn't give much indication as to how the Eurozone debt crisis is to be resolved. There could be several casualties seeing their credit ratings cut, and it comes just as we are due German Economic Sentiment figures today, which is expected to show a three year low. Caution is the theme at the moment and traders of the dollar are taking advantage of the euros weakness. The pair traded at $1.3161 yesterday, which is a level not seen since October 4th. It appears there is a bit of a bear market squeeze at the moment and the pair has moved higher to $1.3205. There is German ZEW Economic Sentiment data today which could have an effect on forex traders watching the euro markets. In fact, the dollar is rising this morning, in line with the bearish view on equities, as traders appear to be more risk adverse. Forex investors have looked to the safer currencies as expectations are that German economic data will show that investor confidence is at a 3 year low. The euro is trading lower against the dollar at $1.3310 which may be pricing in the speculation for tomorrow's data release. The pair see support at $1.3285 and resistance at $1.3390.